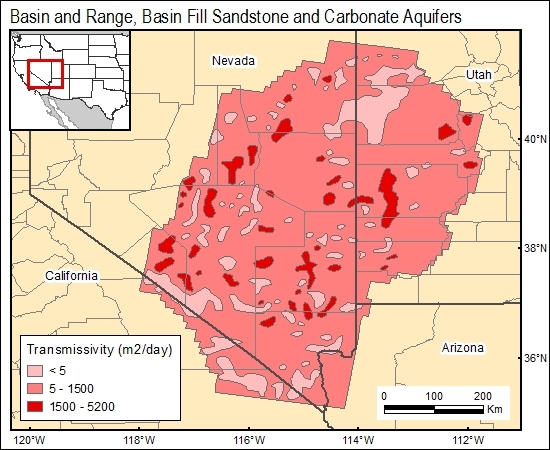 Simulated transmissivity values, from which permeability is inferred, were presented for carbonate aquifers in Nevada by Prudic and others (1985). The distribution of low-permeability consolidated rock, including tuff layers and intrusive bodies was shown by Harrill and others (1988). Harrill, J. R., Gates, J. S., and Thomas, J. M., 1988, Major ground-water flow systems in the Great Basin region of Nevada, Utah, and adjacent states: U.S. Geological Survey Hydrologic Investigations Atlas HA-694-C, scale 1;1,000,000, 1 sheet.